Crystal Dunn scored twice as the Courage won 4-1 on the road over Seattle Reign FC and moved to 10-1-3 (33 points) on the season. The win for the Courage was a strong rebound performance after losing their first game of the season last week to Utah Royals FC. Dunn now has six goals on the season, second only to Christine Sinclair‘s seven for first in the NWSL. Lynn Williams added a goal and two assists in the game for the Courage. The game was a matchup of the top two teams in the NWSL, and the Reign had things going their way early. After a handball on Reign defender Steph Catley in the box, Lydia Williams stopped Lynn Williams’ penalty kick in the 8th minute. Seattle then took the early lead in the 18th minute. A Megan Rapinoe corner kick was initially saved by Courage goalkeeper Katelyn Rowland, but the rebound went to the feet of Megan Oyster. The defender tapped it up and over Rowland for her first goal of the season. But after that, North Carolina scored four unanswered goals. First, Lynn Williams made up for failing to convert on the PK by heading home a cross from Jaelene Hinkle to tie the score 1-1 in the 27th minute. It’s Hinkle’s fourth assist of the season, tied for the league lead, and Williams’ fourth goal of 2018. Then in the 33rd, Dunn scored her first of the game on an assist from Lynn Williams. Courage defender Merritt Mathias scored her second goal of the season in the 48th minute to make it 3-1. Mathias’ effort was a hard, bending shot from outside of the box that Lydia Williams got a hand on but couldn’t keep out of the back of the net. Dunn added her second of the afternoon in the 70th minute, once again on an assist from Lynn Williams, to put the game out of reach. Dunn finished the game with six shots on goal and five chances created. In the match, Courage midfielder McCall Zerboni became the first player to reach 10,000 regular season minutes and finished the game with a team-high 80 touches and five interceptions for North Carolina. It’s the fourth time this season the Courage have scored four goals in a game, all coming on the road. Through 14 games, the Courage have scored 28 goals and conceded 13, a goal differential of +15. They are 6-0-1 on the road. The Reign dropped to 5-3-4 with 19 points and into third place with the loss. The Reign were without defender Lauren Barnes — who could’ve joined Zerboni as the second player to reach the 10K minutes mark — after she suffered a concussion in last week’s game. The Reign were also without midfielder Jess Fishlock due to injury. Courage midfielder Sam Mewis and defender Abby Dahlkemper also missed the game due to injury. As they often do, the Courage recorded the most total shots in the game, 25-16, as well as shots on goal, 14-5. Seventeen of North Carolina’s shots came in the first half. The Reign managed to get the better of the possession battle, though, 53.2% to 46.8%. They also had more corners, 11-5. The Reign will now head to Sandy, Utah, for a Wednesday night game vs. Utah Royals FC. The Courage are next in action on Saturday, June 30, on the road vs. the Orlando Pride. Match ends, Seattle Reign 1, North Carolina Courage 4. Second Half ends, Seattle Reign 1, North Carolina Courage 4. Offside, North Carolina Courage. McCall Zerboni tries a through ball, but Crystal Dunn is caught offside. Corner, North Carolina Courage. Conceded by Megan Oyster. Attempt saved. Crystal Dunn (North Carolina Courage) left footed shot from the centre of the box is saved in the centre of the goal. Assisted by Meredith Speck. Attempt missed. Elizabeth Addo (Seattle Reign) right footed shot from the centre of the box is close, but misses to the right. Assisted by Stephanie Catley with a headed pass following a corner. Corner, Seattle Reign. Conceded by Katelyn Rowland. Attempt saved. Megan Rapinoe (Seattle Reign) left footed shot from a difficult angle on the left is saved in the bottom left corner. Assisted by Elizabeth Addo. Attempt blocked. 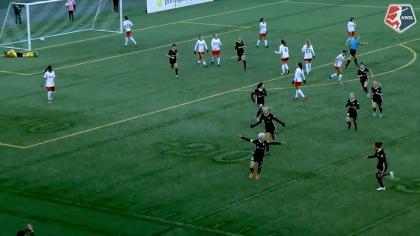 Allie Long (Seattle Reign) right footed shot from outside the box is blocked. Assisted by Megan Rapinoe. Attempt saved. Crystal Dunn (North Carolina Courage) right footed shot from the centre of the box is saved in the centre of the goal. Assisted by Debinha. Corner, Seattle Reign. Conceded by Kaleigh Kurtz. Attempt missed. Adriana Leon (Seattle Reign) right footed shot from outside the box is close, but misses the top left corner. Assisted by Megan Rapinoe. Substitution, North Carolina Courage. Kristen Hamilton replaces Lynn Williams. Attempt missed. Elizabeth Addo (Seattle Reign) right footed shot from the right side of the box is too high. Assisted by Jodie Taylor. Attempt saved. Lynn Williams (North Carolina Courage) right footed shot from a difficult angle on the left is saved in the centre of the goal. Assisted by Crystal Dunn. Attempt missed. Nahomi Kawasumi (Seattle Reign) right footed shot from the centre of the box is close, but misses to the left. Attempt saved. Crystal Dunn (North Carolina Courage) right footed shot from the centre of the box is saved in the centre of the goal. Attempt blocked. Debinha (North Carolina Courage) right footed shot from the centre of the box is blocked. Assisted by Lynn Williams. Goal! Seattle Reign 1, North Carolina Courage 4. Crystal Dunn (North Carolina Courage) left footed shot from the centre of the box to the bottom right corner. Assisted by Lynn Williams with a through ball. Attempt blocked. 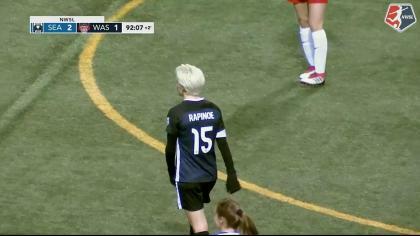 Megan Rapinoe (Seattle Reign) left footed shot from outside the box is blocked. Assisted by Nahomi Kawasumi. Hand ball by Crystal Dunn (North Carolina Courage). Attempt saved. Crystal Dunn (North Carolina Courage) right footed shot from the left side of the box is saved in the bottom left corner. Assisted by McCall Zerboni. Substitution, Seattle Reign. Adriana Leon replaces Beverly Yanez. Substitution, Seattle Reign. Nahomi Kawasumi replaces Alyssa Kleiner. Attempt missed. Elizabeth Addo (Seattle Reign) right footed shot from the right side of the box misses to the left following a corner. Attempt saved. Megan Rapinoe (Seattle Reign) right footed shot from a difficult angle on the right is saved in the bottom right corner. Assisted by Beverly Yanez. Substitution, Seattle Reign. Morgan Andrews replaces Rumi Utsugi. Dangerous play by Crystal Dunn (North Carolina Courage). Attempt saved. Megan Rapinoe (Seattle Reign) right footed shot from long range on the left is saved in the bottom left corner. Assisted by Jodie Taylor. Goal! Seattle Reign 1, North Carolina Courage 3. Merritt Mathias (North Carolina Courage) right footed shot from outside the box to the top right corner. Corner, North Carolina Courage. Conceded by Kristen McNabb. Attempt missed. Beverly Yanez (Seattle Reign) header from the centre of the box is too high. Assisted by Megan Rapinoe with a cross. Second Half begins Seattle Reign 1, North Carolina Courage 2. First Half ends, Seattle Reign 1, North Carolina Courage 2. Attempt saved. Lynn Williams (North Carolina Courage) right footed shot from outside the box is saved in the centre of the goal. Assisted by Denise O'Sullivan. Attempt blocked. Debinha (North Carolina Courage) right footed shot from the left side of the box is blocked. Attempt missed. Beverly Yanez (Seattle Reign) right footed shot from the right side of the box is close, but misses to the left. Assisted by Elizabeth Addo. Attempt missed. Jodie Taylor (Seattle Reign) header from the right side of the six yard box is high and wide to the right. Assisted by Megan Rapinoe with a cross following a corner. Goal! Seattle Reign 1, North Carolina Courage 2. Crystal Dunn (North Carolina Courage) right footed shot from the centre of the box to the bottom left corner. Assisted by Lynn Williams. Attempt missed. Debinha (North Carolina Courage) right footed shot from outside the box is close, but misses to the right. Assisted by Jessica McDonald with a headed pass. Corner, North Carolina Courage. Conceded by Alyssa Kleiner. Debinha (North Carolina Courage) hits the bar with a right footed shot from very close range. Attempt saved. Lynn Williams (North Carolina Courage) right footed shot from outside the box is saved in the centre of the goal. Goal! Seattle Reign 1, North Carolina Courage 1. Lynn Williams (North Carolina Courage) header from the centre of the box to the top left corner. Assisted by Jaelene Hinkle with a cross. Corner, Seattle Reign. Conceded by Jessica McDonald. Corner, Seattle Reign. Conceded by Merritt Mathias. Offside, Seattle Reign. Megan Rapinoe tries a through ball, but Allie Long is caught offside. Goal! Seattle Reign 1, North Carolina Courage 0. Megan Oyster (Seattle Reign) left footed shot from very close range to the top left corner following a set piece situation. Attempt saved. Megan Rapinoe (Seattle Reign) right footed shot from a difficult angle and long range on the left is saved in the bottom left corner. Attempt missed. McCall Zerboni (North Carolina Courage) right footed shot from outside the box is close, but misses to the right. Assisted by Crystal Dunn. Attempt saved. Debinha (North Carolina Courage) left footed shot from the centre of the box is saved in the bottom right corner. Attempt saved. Lynn Williams (North Carolina Courage) left footed shot from the left side of the box is saved in the centre of the goal. Assisted by Crystal Dunn with a through ball. Attempt missed. Jessica McDonald (North Carolina Courage) header from the centre of the box is just a bit too high. Assisted by Debinha with a cross following a corner. Corner, North Carolina Courage. Conceded by Beverly Yanez. Attempt missed. Crystal Dunn (North Carolina Courage) left footed shot from the centre of the box is close, but misses to the right. Assisted by Debinha with a cross following a corner. Penalty saved! Lynn Williams (North Carolina Courage) fails to capitalise on this great opportunity, right footed shot saved in the bottom right corner. Penalty conceded by Stephanie Catley (Seattle Reign) with a hand ball in the penalty area. Attempt blocked. Jessica McDonald (North Carolina Courage) right footed shot from outside the box is blocked. Assisted by Crystal Dunn.